Ingredients: Ridgemont Reserve 1792 bourbon "washed" in rosemary duck fat, six-week barrel-aged Madeira, Angostura bitters and organic maple syrup. Bob Peters, head mixologist at Pisces, doesn't just make drinks, he creates them. His latest, which involves succulent duck fat and herbaceous rosemary, is a culinary-inspired cocktail that may be the most inventive one to date. 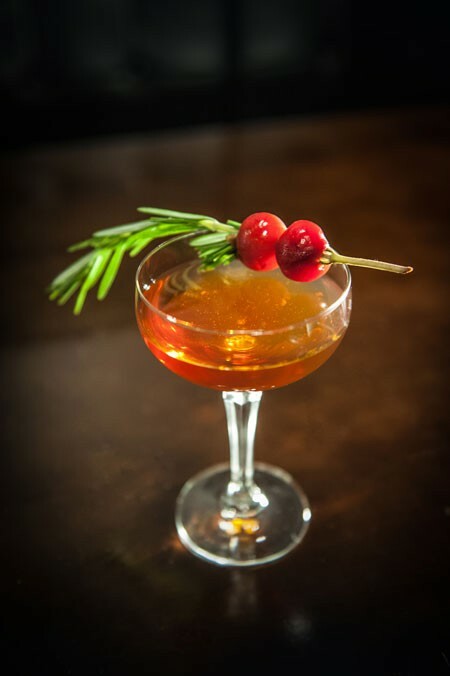 A year in the process from conception to execution, Peters recently unveiled the result of his beverage experiment at the Manhattan Project Tasting Party held at Pisces. Peters began by barrel-aging Madeira wine for six weeks, then washing bourbon with rosemary duck fat. (Fat-washing is a technique that mixes melted fat with a spirit and, once the mixture cools, skimming the fat off, resulting in a flavored spirit.) The crafty technique creates a tasteful consistency, eliminating any fatty residue. 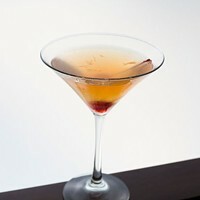 Peters builds the Manhattan by adding maple syrup, the last ingredient, and finally, putting the mixture back into the barrel to age an additional six weeks. "I started thinking of possibilities and put technique on top of technique and this is what I came up with," Peters says. The finished product is a silky-smooth, smoky cocktail with luscious undertones of duck and herbs. This cocktail is only available for a limited time.